Although it's added, there still doesn't show a red asterix next to the zipcode at all and the customers aren't filling it out. I need to change the word from post code to Zip code and also need the Asterix next to it. Any suggestions? I just ended up hacking it with the red Astrix. And changed the word post code to zip code. It looks perfect. But I hope this will be fixed in the upcoming 1.5 v of Opencart. Qphoria wrote: YOU DO NOT NEED TO APPLY THIS MOD IN 1.4.9 OR LATER AS IT HAS ALREADY BEEN ADDED AND AUTOMATICALLY REQUIRES BASED ON THE COUNTRY! That has nothing to do with Opencart but with the custom template your using! IF YOU USE A CUSTOM THEME YOU MAY HAVE TO MODIFY SOME OF THE THEME FILES!!! i2Paq wrote: YOU DO NOT NEED TO APPLY THIS MOD IN 1.4.9 OR LATER AS IT HAS ALREADY BEEN ADDED AND AUTOMATICALLY REQUIRES BASED ON THE COUNTRY! Then post once again what has to change in the Theme files? Thanks for the help, I have had the same problem, your solution worked perfectly (1.4.7). ok how would i get rid of the Your Address field altogether and have them not required is this possible? Hi, ages ago I did this process for a client but only did it for new account register. I forgot to do it for the guest checkout. Is there a way of doing this? What are the files I would need to change? The version of my opencart got removed (Don't ask me how!) is there a way of finding out? This will help me decide which code to use. It's sorted now, backtracked. Still not sure how to find the version though. @javabean: Select YES in your Admin -> System -> Localization -> Country -> United States -> Zip Code Required. Do the same for Canada. AWESOME! fixed it. thanks for the heads up. i should've looked closer. 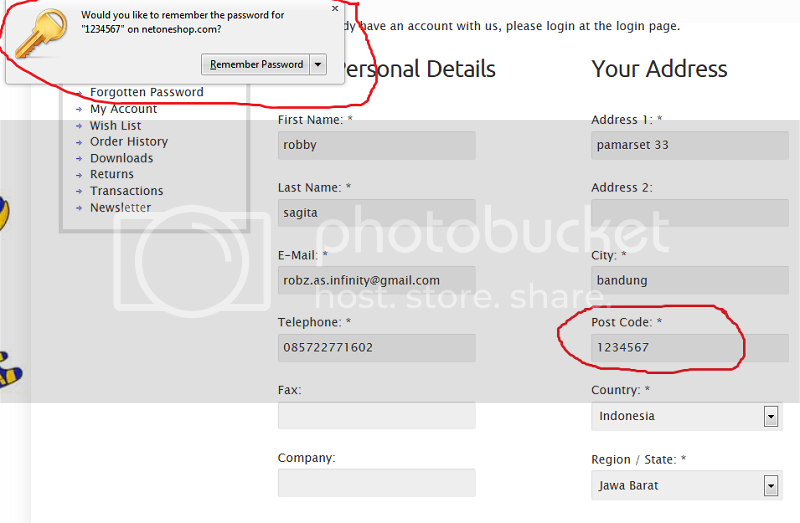 And theres something strange, when my browser ask me to remember my password, it didnt remember my email, instead its remember my POSTAL CODE..
i cant logging in even i input my correct email address and password, looks like the browser remember my postal code, not my email, or theres something broken on my open cart controller?? I recently purchased the Shoppa Theme and the Post codd shows as mandatory for the UK but not for the US, I'm using version 1.5.4, can you tell me how to correct this. @vntgeclassified Not sure if you are still looking for an answer, but it's a few posts above yours. SOLVED Thank You, Overlooked option in System/Localization/Countries in the Admin Panel. Just add <font color="red">*</font>, in the php! All you guys are doing so difficult with editing source files etc. You don't have to do ANYTHING of this. Last edited by innocrea on Thu Sep 26, 2013 11:52 pm, edited 2 times in total. I made postcode required for my country, it works, i now cant submit the form unless i enter a postcode, but it doesnt dhow any text telling uts required, its only showing the standard red star. any help on this? Has anyone tried this on OC 1.4.8b? ?